"Alright, beat my high score.... Let's get started." Professor Kokonoe Mercury (ココノエ＝マーキュリー) is a leading member of Sector Seven, the daughter of two of the Six Heroes, Jubei and Nine the Phantom and niece of Celica A. Mercury. She is an accomplished scientist and helped organize the coup d'etat to put Homura Amanohokosaka on the throne of the Novus Orbis Librarium. Kokonoe is nearly always seen communicating with Iron Tager. 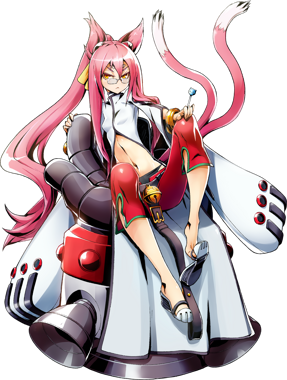 Kokonoe first appeared as an NPC in BlazBlue: Calamity Trigger and was made playable as the second DLC character for BlazBlue: Chrono Phantasma. Her quarter-length jeans are bright red with green rims, and are fastened onto her hips with a black belt with a large bell hanging from the center - underneath this bell is the strap for the belt. 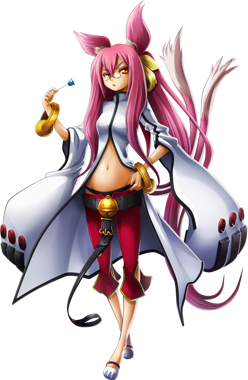 Kokonoe's look is finished with white wedge sandals, large golden bracelets on both wrists, and her signature lollipop. Kokonoe also has two pink tails with white tips. She is usually in a bad mood and acts very unfriendly and listless. Also, she's a Mad Scientist. She researches without end and skips even sleep, able to continue only because of the special candy she's always licking to maintain her strength. The definition of grouchy, Kokonoe is nearly always in a foul mood and ready to let anyone know about it. She is stubborn, sharp, and cocky to the point of hubris. However, every vice she possesses is backed by considerable skill and knowledge across many subjects. From metaphysics to bionics and Ars Magus to chemistry, Kokonoe knows it all. However, science is Kokonoe's true love and she dedicates herself to it. Her dedication is so intense that she often forgoes sleep, and will cross moral lines with little to no hesitation. Kokonoe believes that that science is superior to Ars Magus, since there is too little information about and too few studies into Ars Magus, and she believes science is ultimately a safer power. This philosophy of hers permeates Sector Seven. Underneath her gruff exterior is a caring side, however seldom it surfaces. She cares greatly for her subordinates, and in particular for Tager, whom she shares a special bond with. The death of her mother greatly influenced her life, and she has a deep seated hatred for Yuuki Terumi, her mother's murderer. Her bond with her father, Jubei, is greatly strained and the two do not get along despite her father's efforts. For the most part, this is due to Jubei's absence during Kokonoe's upbringing. Unlike her renowned parents, Kokonoe exists within public discourse as a myth, of which little is known; not even her heritage as a half-beastkin is public knowledge. Kokonoe herself has, like others of her species, also experienced racial prejudice. There are times when Kokonoe can seem as if she is not paying attention, and most of the time, she doesn't. The easiest way to grab her attention is with something that interests her, and everything else may as well not matter. She often swears and only shows respect to those who she believes deserves it, regardless of their status; even Rachel Alucard and Hakumen, despite their feats in history, are not safe from her sharp tongue. According to Tager, she has an addiction to silvervine candy. Like her mother, Kokonoe is nearly always seen consuming sugary delights, especially sweetened coffee, the aforementioned Silvervine, and Ferrero Rochers, the last of which is her favorite among all. Due to this sweet tooth, Kokonoe collects various types of sweets from around the world in her spare time. Even though she is reluctant to commit to combat and does her best to personally avoid it, Kokonoe is competent in it. She uses various machines of her own design to help her best her opponents, including two exploding gauntlets and a large hammer with a drill on the head. She can summon either at will. Among her inventions also includes a small gun which fires a large ball of fire, a gun that shoots ice, a machine gun, and a large rocket, if only to name a few. During a fight, her in game Drive is Graviton, which allows the control of gravity with a small device; however, these only last so long. As Kokonoe rarely actually fights, she spends much of her time assisting Tager on missions, making her a competent coordinator for him. She can easily hack the mainframe of the NOL and surveillance cameras. Even when both Tager and Lambda were given to her in states of near death, she was able to resurrect both of them with science alone, although the methods used were morally dubious. Despite being personally against the use of Ars Magus and sorcery, Kokonoe is skilled in both, having a natural talent for them as Nine's daughter. She has to be pushed to her extremes in order to use either, however, but she has enough latent sorcery power to seal the core of a Nox Nyctores, and enough Ars Magus aptitude to actually wield one. Her own ability in Ars Magus is so great that she created a sealing mechanism that not only kept Hakumen bound, but gave Rachel difficulty in undoing. Kokonoe also has incredible natural instincts, owing to her feline heritage, and will always land on her feet after a fall. There are, however, a few weaknesses that Kokonoe possesses. At times, her cockiness can cloud her judgement and cause a fatal error, and despite her powerful bloodline, her body is weaker than both Nine's and Jubei's. As she is always pushing her body to its limits with Silvervine to constantly stay awake, she would inevitably collapse without it. A genius of a scientist working at Sector Seven and the "mother" of Tager, whom she created. She led the operation to salvage Hakumen, who had fallen into the Boundary, and although she stayed silent on Hakumen's actions afterwards, she did send Tager to monitor him from afar. Like so, she continues to experiment day and night, so that she may defeat "Yuuki Terumi." A genius of a scientist working at Sector Seven and the "mother" of Tager, whom she created. She was born with the ears and tail of a cat. Although she sent Bullet and Tager to detain the "Grim Reaper" who had appeared in Kagutsuchi, she harbors doubt about the very world itself. Following the mystery of "Who exactly is the Hakumen of the Six Heroes that I salvaged?" she decides to head to Kagutsuchi herself. A feline beastkin born between two of the Six Heroes, Jubei and Nine. She's currently the lead scientist at Sector Seven, and she is a genius. Kokonoe created Tager and is the professor of both Litchi and Arakune. Her knowledge and understanding of the world is unprecedented, and she was the first non-Observer to realize the loop in the world. She is level-headed and calm, unless her buttons are pushed. Then be prepared for the wrath of the heavens itself. After salvaging Hakumen, she secretly assigned Tager to keep a watchful eye on Hakumen's actions. To fulfill her ultimate goal, destroying Yuuki Terumi, she works day in and day out, continuously researching. Currently, she has made a pact with Kagura to further expand her resources. A genius scientist belonging to Sector Seven. She has the ability to use sorcery, but is fixated on using the power of science to fight. She was also the one to bring Tager and Lambda to life, as well as the developer of Artificial Causality Phenomenon Weapons, which rival even Nox Nyctores. The mobile game Mabinogi Duel stars Kokonoe as a playable card. In the BlazBlue 10th Anniversary Character Poll, Kokonoe placed 1st out of the 84 candidates. She scored one place above Hakumen and one place below Platinum the Trinity. She had 1,756 votes. Kokonoe's birthday is Invention Day. All of Kokonoe's movelist is named after various "Armaments" of her own design. Kokonoe (ココノエ) can be written as 九重, meaning "ninefold"
According to Tager, Kokonoe has an addiction to Silvervine Candy. Kokonoe is the one who gave Tager his current name. She apparently created it on a whim. She is also the creator of his glasses. Naoto Kurogane has noted that Kokonoe has an extraordinarily high life-force value. Kokonoe was the first ever SS-class Criminal wanted by the NOL. She personally erased all traces of her existence on their system. Kokonoe shares her English voice actress, Julie Ann Taylor with Tsubaki Yayoi and Izayoi. Like her mother, Kokonoe has an insatiable sweet tooth. Kokonoe was the first person who was not an Onlooker to notice the Looping World. Given that she was born after the Dark War and her mother went missing less than a year later, Kokonoe is 89 - 90 years old by the end of the C-series. Kokonoe is the fifth DLC character in the series, and the second introduced for BlazBlue: Chrono Phantasma after Yuuki Terumi.